As Massachusetts charter schools enroll more students with disabilities, who exactly are they serving? At Lawrence Family Day Charter School, which caters to poor and minority students, fewer than 7 percent of students have special needs – far below the statewide average. Director Ralph Carrero said one reason for the low numbers is the school has an intensive program to catch problems and intervene early, so students improve and avoid being misdiagnosed with learning disabilities. But he also said that for students who are more severely disabled, particularly those who need substantially separate classes, charter schools simply do not have the same resources as district schools to educate them, because charter schools have fewer students with those needs. “Charter schools don’t have the economy of scale that district schools have,” Carrero said. Over the last five years, charter schools have been educating more students with disabilities, gradually narrowing the gap between charter and district schools. While around 17 percent of students at district schools have disabilities, the percentage of disabled students at charter schools has grown from 12 percent in 2010-2011 to 14 percent in 2014-2015. 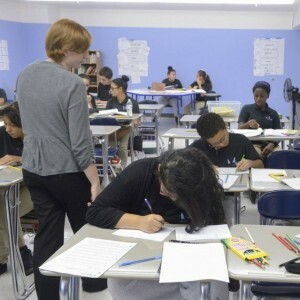 But an analysis by The Republican of data obtained from the Massachusetts Department of Elementary and Secondary Education shows that charter and district schools are not necessarily educating the same types of students with disabilities. Children with the more severe types of disabilities are still more likely to end up in the traditional public school system than in charter schools. The issue has come up recently as part of a debate about whether to expand access to charter schools.